June 2017 ProPay made security protocol changes. To use ProPay inside Boulevard, you'll want to ensure that you have Boulevard 2018 file version 23.1.2.0 or higher installed. For your customer's protection, once the payment method has been added, the full credit card number can not be accessed in it's entirety. 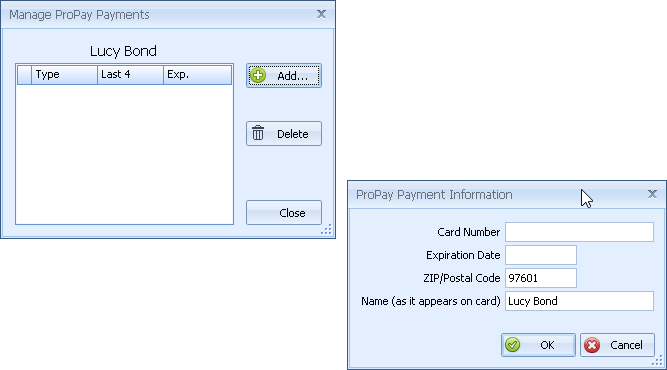 The payment information is stored using ProPay's ProtectPay service. Open the contact's profile, click the button. Enter in the applicable fields Card Number, Expiration Date, ZIP/Postal Code and Name (as it appears on card). When finished click OK to accept and close the ProPay Payment Information form, then click Close. Open the contact's profile and click the button. Select the card to be removed, then click Delete. Repeat step 2 for any additional cards to be removed, then click Close.